I have given you my soul. Leave me my name! — John Proctor, explaining why he cannot confess to witchcraft to save himself from the gallows. Arthur Miller's The Crucible was the product of his rage about Wisconsin Senator Joe McCarthy's hearings that coerced people into naming names which ended the careers of friends and colleagues. His link of that dark late 1940s and early 1950s chapter in American history to an equally shameful seventeenth century era when puritanical sexual mores and belief in witchcraft had even more dire consequences. He also meant it as a cautionary tale for the separation of church and state, as well as an indictment against greed and the repression of women. Sad to say Miller's allegorical condemnation of narrow-mindedness and greed is relevant to this day. Today's theater goers will envision plenty of ever more disturbing examples of groups for Miller's Abigail Williams and her little circle of friends were stand-ins. The international cast of director Ivo van Hove's stunning new production underscores the fallout and suffering caused by narrow-minded, punitive group-think world-wide — and does so without obvious contemporary references to cheapen and diminish the viewer's own emotional response. I've found Van Hove's re-interpretations of classic twentieth century dramas by stripping them down to their essential meanings intriguing. However, I couldn't help wondering if this were the best first introduction to these the works. Even his terrifically compelling version of Arthur Miller's A View From the Bridge last year left me wishing young theater goers could have experienced a production that gave a fuller picture of the Brooklyn neighborhood and community that shaped Eddie Carbone. 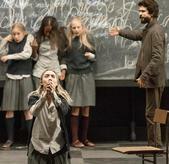 Not so, The Crucible now at Broadway's Walter Kerr Theater. This is the best, most riveting version of the play I've seen, as well as a production that fully justifies all the praises and awards heaped on the Belgian director and his brilliant collaborator Jan Versweyveld's scenic and lighting wizardry. While at 2 hours and 45 minute, more traditional productions have usually had preachy, slow-moving spots, this just as long version is consistently forceful and lightning fast. The staging isn't as bare bones as A View From the Bridge. Yet the theater's deep, wide stage is uncluttered and the characters wear just one simple, modern costume. The one dominant prop, a large chalkboard, establishes Abigail and her friends as trouble-makers who are still schoolgirls whose excuses and accusations are going to be taken more seriously than they should. That chalkboard's color envelopes the rest of the stage, and combined with the black and brown worn by all the characters to underscore the dark, grim story unfolding before us. Even if they've never seen The Crucible, on stage, many people know the story either from the movie or as part of their high school curriculum. I'll therefore stick to what's special about this production, and include a plot synopsis at the end of the production notes below for anyone unfamiliar with it or wanting a refresher. The inclusion of Miller's name above the title attests to Mr. Van Hove's not allowing his status as a star of today's director-driven theater to tamper with the author's text. Except for some minor Miller estate approved alterations and elimination of a few minor character, the words you hear are Arthur Miller's; and the actors deliver them in keeping with original time frame, despite their modern dress. The actors listed in bold-face type — in fact the entire 38-strong cast — vividly give life to their characters , whether representing those with the power to oppress or those subject to their dictates. You'll have to look twice to recognize the gentle Irish girl of the Oscar nominated film Brooklyn in this blonde and fiercely malevolent Abigail. But she's just as compelling as the plot galvanizing, sexually precocious teenager whose duplicitous actions after her brief fling with John Proctor (Ben Whishaw) ends in her being ousted from the Proctor farm and facing the community's opprobrium as the leader of the little click's immoral behavior. The British Mr. Whishaw, is a physically less imposing than Liam Neeson who last played Proctor on Broadway, and Daniel Day Lewis who played him in the film. But, having seen his bravura turn in the off-Broadway production of The Pride , his wide-eyed, slight figure ultimately make his passionate defense of his wife and his own good name even more heartbreaking. Sophie Okonedo gives an understated but potently touching performance as Elizabeth Proctor, the wife whose angry response but eventual understanding and forgiveness of her husband's infidelity results in her being falsely condemned to death for witchcraft. Of course you can't have victims without villains and Clarán Hinds is ideally cast as the unyieldingly autocratic Deputy-Governor Danforth. The big trial scene in which Danforth huddles with other members of his court is incredibly chilling. Other standouts, too many to describe all, include Tavi Gevinson as Mary Warren, the one girl who could save Elizabeth Proctor but who's inevitably bullied back into Abby's circle. . .Brenda Wehle's tragic Rebecca Nurse. . . Jason Butler Harner as the self-protective Reverend Parris. . . Jim Norton as John Proctor's feisty but also doomed fellow farmer . . .. Bill Camp as the Reverend John Hale who too late tries to persuade Danforth to see the folly of practicing law according to fire-and-brimstone principles. Thanks to an assist from movement specialist Steven Hoggett, all these characters are fluidly and imaginatively moved on and off stage. Like View from the Bridge, the mounting tragedy here is once again intensified with a brooding sound track, in this case by composer Philip Glass. For all the praises for the lean Van Hovian style, all his plays feature some eye-popping theatrical effects. In The Crucible, there's a truly spectacular conclusion to the second act. Van Hove and designer Versweyveld do once again give in to their occasional lapse into theatrical overkill. — like having the hysterical girls actually levitate and having a live wolf-look-alike breed of dog known as a Tamaskan portentously walk across the stage at the beginning of the third act. (Natuarlly he's trained to give a starry performance by award-winning show dog trainer William Berloni). That said, these are minor complaints in the light of a thoroughly satisfying new look at an enduringly absorbing and provocative play. Cast: Ben Whishaw (John Proctor); Sophie Okonedo (Elizabeth Proctor). Saoirse Ronan (Abigail Williams); Ciaran Hinds (Deputy Governor Danforth); Bill Camp (Reverend John Hale), Tavi Gevinson (Mary Warren) and Jason Butler Harner (Reverend Parris). In the Puritan New England town of Salem, Massachusetts, a group of girls are caught dancing in the forest with a black slave named Tituba. by the local minister, Reverend Parris. One of the girls, Parris's daughter Betty, falls into a coma-like state which raises questions of witchcraft though separate arguments between John Proctor, Parris, and several other Salem citizens, indicate that the real issue (as is so often the case) is money and land deeds. Abigail Williams, the girls' ringleader, turns from accused to accuser. She is motivated by jealousy and anger. (While working for at the Proctor farm, she had an affair with John, who no longer wants her and allowed his wife to fire her). A number of local women are arrested and Elizabeth Proctor urges her husband to denounce Abigail as a fraud, even though it will mean exposing their marital problems. When she is also accused John persuades their maid Mary, a member of Abigail's circle, to testify against the girls. Her testimony backfires when the accuse Mary of bewitching them upon which Proctor does confess his adultery. To test his claim, Deputy Governor Danforth summons Elizabeth who, hoping to save her husband, inadvertently causes his arrest. The play then moves to the following summer by which time Abigail has fled and Reverend Hale, the witchcraft expert, has lost faith in the court and begs the accused witches to confess falsely in order to save their lives. When they refuse Danforth, unnerved by civil unrest, asks Elizabeth to talk John into confessing. Proctor agrees but revokes his confession, and the play ends with his going to the gallows with the others rather than sacrifice his good name and live when the others can't.